I don’t remember the sound of his voice anymore or the way he looked when he walked down the halls with his funny swagger. I don’t remember the butterflies I used to get when I saw his face across the room. I barely remember anything we shared other than a silly kiss at the homecoming dance. All that’s left is the notes we passed and the pictures. I’m almost entirely sure I’ve never been the same since he’s been gone. I cringe every time I hear someone joke about death and the stories of others taking their lives makes my stomach so sick I want to fall to the floor. And during the month of March I will always overanalyze and reprocess it all and wonder if just maybe there was something I could have done to change it all. Maybe had we all paid a little closer attention we would have seen something. Or maybe had we not gotten so close then other things wouldn’t have happened. Or maybe had I listened a little more. They always tell you that there’s nothing you could have done, that when someone decides to take their own life there is no stopping them, they’ve already made up their mind. I wonder what went through his head, if he was scared, if he was mad, sad, or alone. I wonder if he thought about us, or if he was so hurt he didn’t even remember. I wonder if he felt any pain, or if he had time to regret it. I wonder if he was still here, where we would be. There’s a lot of things I wonder but won’t ever know. I do know though that had I ever had the chance I would have said something like this: You are enough, right now you feel at the bottom of the world, as if everything is falling down on you a thousand miles an hour and there’s no way to stop it but it will stop. I can’t tell you how and I don’t know when but if you just push a little harder I can promise you that it will stop and the rain clouds will stop pouring down and your raibow will appear and you will have your sunny days and oh my will they be so glorious. I know you want to make a very permanent decision but right now your pain is temporary it won’t last forever if you just hold on. Just hold on because somewhere in this great big world there is a place for you, just keep looking and when you think you’ve looked everywhere look just a little more. I know you don’t want to be here anymore but if you just close your eyes and imagine the day when you wake up happy to be alive I promise you will get your day too, and you will be happy to wake up. I may not know what you’re feeling or what you’re going through but I do know that you are loved and if by nobody else then you are by me. Just hold on a little longer, just push through a little more, just smile a little harder, and just keep keeping on a little farther because somewhere eventually there is a happy ending for you too, and my goodness do you deserve it. None of us want to talk about suicide because it’s so horrible, the idea of someone taking their own life is awful. The questions and pain it leaves behind is unbearable. It’s much easier to turn our eye or back to the fact that it is happening. For every completed suicide there are 25 attempts. In order to significantly reduce this number we must speak up, we must realize that this life is not easy and we as humans aren’t expected to be perfect 100% of the time. In order to stop turning our back we must raise our hands in support of those around us that are dealing with such scary thoughts. The thought of this world being a better place without you in it is downright terrifying. So let’s talk, let’s end the stigma, let’s stop glorifying depression and suicide. Let’s realize the need of our generation to be welcoming and understanding and accepting of those around us that are suffering so that nobody else has to forget the laughter of a friend or the warmth of their embrace. Let’s surround each other with the encouragement because maybe if we all just hold on then we can be in this together. If you or someone you know is suicidal PLEASE reach out for help to this hotline: +18002738255 YOU. ARE. ENOUGH. In forever memory of Matthew. I’ve been reminded a lot lately of what the days used to be like for me. In just a little over 2 weeks I’ve managed to fight off a viral infection that turned into a sinus infection, only to find out a week later I have yet another sinus infection and an ear infection. You see these would be rather simple things to fight off given a normal body but with my terrible immune system and my POTS being normal people sick really throws me under deep. My body feels weak again, like it used to two years ago. I’m covered in the chills and the sweats that used to be a normal everyday thing for me. Im stuck in my bed again because moving around is too much. These last two and a half weeks have reminded me of how far I’ve come. It’s very easy for me to often forget or not realize that I’ve made any progress at all, but as I lay here looking like a waterfall from sweating and not doing anything I remember that this used to be a daily occurrence for me but is no longer. As I walk around feeling as if my weight is being pulled to the ground I remember that for a while I haven’t felt these feelings and I am thankful, so very thankful. I always say that it shouldn’t be possible for chronically ill kids to get normal people sick but I have yet to see that day. I’m thankful tonight even though I feel like I’m falling apart that I am able to realize that slowly but surely I am becoming stronger. It’s hard to verbalize all the emotions I feel right now as I am frustrated in fear that I’m taking 10 steps back, and as I worry how I will manage to catch up on all that I have missed in shook recently but for just a second even I am happy because I see now that the healing has begun. He probably sang and played to me in the womb, because before I could even remember music has been our thing. Growing up I remember dancing on his office table to Cracker, he burned me cd’s of James Taylor to fall asleep to. My first concert was Stone Temple Pilots. Music has been our thing. We don’t have to talk to communicate we can just listen to music together. My dad is the first man I’ve ever loved and he’s the best man in my entire world. I can only hope someday that should I have hatchlings they have a dad half the man he is because they will be so so very lucky. I have the goofiest memories with this dad of mine and I think that’s what’s so great about him. He does the dad thing but he does it in the cool dad way. In fact he’s such a cool dad that some of my friends enjoy hanging out with my dad more than they enjoy hanging out with me. My dad has taught me to be tough, to get back up when I fall down, and then back up again, and after that again. He patches wounds with duct tape because why use a band aid when duct tape works? He licks blood away instead of going inside to clean the wound off. Okay maybe I just made him sound like a vampire but you get what I’m saying, my dad is tough. The reason I’m so tough, is because he taught me how to be tough. If it’s possible to be a 5′ 6 1/2″ grown man and be tough then you’re talking about my dad. My dad has also taught me that it is entirely possible to be “old” and still be young. My dad is so young and hip I’m certain that should there ever come a day I’m drunk chances are he’ll be drunk and partying right next to me. Let’s be honest when my dad has friends over they usually are cute racecar drivers, or some random musician, or some other young human that I stare at awkwardly and wonder how MY dad managed to befriend said human, except for Dudley, Rick, Keith, and Kevin Lewis, the only friends I think he has that are his own age. And while teaching me that it’s possible to still beold and cooolll he has also demonstrated to me in many ways that as cool as his old body may be it will still break so I should probably watch out for that when I get old and am cool like him. My dad isn’t a gushy mushy lovey guy but he shows his love in ways I’m not sure he always realizes, like the nights we stay up late and consecutively watch independent movie after independent movie on Netflix, or our heated conversations about how stupid politicians are, or our garage talks where I watch him mess around with bike parts on hot sunny summer nights in the garage. My dad is one awesome dad. I think sometimes dads go unnoticed or people aren’t as lucky as I am and aren’t gifted as awesome of a dad as I have been. My dad knows when he hears a loud thump he should come find me and make sure I’m still conscious, my dad knows the look on my face I make before I’m about to fall over, and my dad has some awesome Mer catching and carrying skills. On days when it seems that everything is impossible he reminds me that it is and I just have to try. I’ll always be thankful to have such a rad dad that has not only cared for me over the years but taught me how to be a good person in this world. While I may not be small enough to dance on his desk anymore I can still sit on it and belt out lyrics with him in our so terrible singing voices. My rad dad I am so thankful you’ve taught me how to be rad and I can’t wait for the many more years I have of learning from you. BUT I BOUGHT A KAYAK ANYWAYS! I impulse bought a kayak last month. Which long story short is well interesting, for quite a few reasons. My justification was “YOLO”, the old middle school term that means “you only live once.” I used money from my savings account to purchase said kayak, the money that I’ve been depositing from all of my work checks to afford to go to college. My reasoning was that because I now have said kayak maybe I can use said kayak to convince cute boys to come over and kayak with me. However, I didn’t take into account the following things before I quickly went out and purchased a 10ft bumblebee yellow kayak: one being that my sister already has a kayak that fits the two of us in it perfectly, the second thing I “forgot” to consider is that in just about three months I will be moving out of the house to an apartment downtown that has absolutely no room to store my 10ft bumblebee kayak, not to mention the fact that there aren’t many places to kayak downtown on campus should I bring my new kayak with me, nor will I have a way to get my kayak to the place in which I would do said kayaking. BUT I BOUGHT THE KAYAK ANYWAYS! I’ve only had my bumblebee kayak for about a month and I’ve already experienced many exciting or well interesting things I should say with it. The first was the actual purchasing of the kayak. The very day I decided to buy a kayak it wasn’t four hours later and I was driving home with a boat in the car and my sister stuffed in the back with it. You see the buying part was very interesting because that color decision was quite the dilemma and the cute kayak sales boy didn’t make my decision process any easier, and when you buy a kayak you have to buy a paddle and all the other necessary kayak accessories. I really know very little about kayaks so this was quite the adventure. If you know me personally then you also know I’m rather small, and so is my sister so the whole kayak purchase really only began this great big adventure. I should also include that prior to my sister receiving a kayak as her birthday present last year I had really only gone kayaking about three other times. One of those being for Mallorys birthday in which we were in a kayak of ether when she noticed a spider in our boat and proceeded to stand up in the boat!!! (Something even a kayak amateur knows you should never do!!) so I really don’t have a whole lot of kayaking skills either BUT I BOUGHT THE KAYAK ANYWAYS!! Now we don’t have our own dock so we store the kayaks on the neighbors in return allowing them to use them any time they please, which really sounds like a great deal except for the fact that climbing up and down all the stairs to get to the dock is a work out in itself. Then little Mallory and I must lug the boats into the water and then we can finally take off. It seems simple when explained but then again if you know me then you know nothing can be simple…..
Today Mallory and I decided we would go for a nice kayak (I assume that’s what it’s called, I’m still new to this whole thing) on the lake. [I must preface this by saying my sister is very independent.] So today she pulled her boat down to the edge of the dock and then I assisted her in placing it in the water and then she preceded to get into her boat and took off. I also must add that I suggested we line up both of the boats by the dock down from where they are stored so that after she got into her boat I could easily get mine into the water and get in it. (Great plan I know!) But either Mallory didn’t hear that brilliant suggestion or it didn’t occur to her that I might actually need help getting my boat into the water, and well off she went. So next it was my turn to hoist my 10ft bumblebee boat into the water by myself and then get in it by myself. I do realize this is probably a rather simple task however I happen to be a rather weak person so it makes everything in life just a little more difficult. Anywho I was determined to catch up with Mallory so I leaned down to put my boat in and then somehow managed to crush my thumb in between my boat and the dock, of course I let go of the boat because my thumb hurt like none other. When I looked down at my thumb I saw blood and loose skin, and being the medical nerd I am I lost all attention of my boat and was enthralled by my thumb. My attention was finally shifted back to reality when Mallory loudly yelled my name to which I looked up to see my boat floating away in the lake. I thought maybe I could jump in and catch my boat but then I realized my life jacket was in my boat, and even though I can swim jumping into the lake meant exposing my new wound to lake water and that could possibly give me necrotizing fasciitis (I know I’m quite the over exaggerater) if it wasn’t already dead. So instead I stood on the dock and watched as my bumblebee boat floated away and Mallory screamed all sorts of things. I couldn’t help but laugh because what are the odds that my boat gets in the water and floats away without me. I also laughed because I had absolutely no idea how I would retrieve it. And lastly I laughed because well the look on Mallorys face was priceless. It took about 15 minutes for Mallory to retrieve my boat and send it over to me and she was not happy with me. Once I finally made it into my boat I realized my thumb was still messed up and needed to be tended to but after all the ruckus I had just caused I couldn’t leave my sister to kayak all alone so I made a turnikit for my thumb and off we went and continued on with the kayak adventure. Needless to say we were only on the lake for about 10 minutes before Mallory decided we were done, I know I know all that work for ten minutes. But hey retrieving a lost boat on your own is very tiring I’m sure, but then again it’s not like I know! And while I lay here in my bed and type this blog post in quite a bit of pain (I’m texting this which uses your thumbs and only about 1 and a half of mine are working.) I think what I’m trying to get across is that sometimes you have to just go out and buy a kayak, because you just never know what might come from it. I’m falling asleep tonight with a terribly sore and sad thumb but my heart is so happy as I know we will look back on this day and laugh at all of the ridiculous things that happened. I’m sure this certainly won’t be the last of the bumblebee boat stories. Sometimes in life you just have to go with the flow and live a little even if it means buying a kayak. We are on this earth for only a short time so we might as well make the best and most fun of it, but we should also try to keep all of our digits and appendages when doing so. There are plenty of other productive things I could have spent my day doing, BUT I BOUGHT A KAYAK ANYWAYS. I’ve walked through my storm, I’ve ran through my storm, I’ve sat in my storm and cried. For the last three and a half years I’ve lived out of bottles of pills. When you take a medication for a long enough period of time your body begins to form an addiction to it, your body becomes used to functioning with it. For the last three and a half years my body has become addicted to handfuls of medications. Four handfuls a day of at least three different medications, sometimes eight. These pills are the only way it’s been possible for me to walk through my storm. For the last three and a half years I have woken up and drug myself out of bed and down to the kitchen where I pull out eight different bottles, I swallow a handful of pills. For the last three and a half years I have eaten lunch and reached into my pocket to pull out a handful of pills, and I’ve swallowed them. For the last three and a half years I have eaten dinner and made my way to the cabinet where I pull out my basket of pill bottles, and I’ve emptied them into my hands, and I’ve swallowed them. For the last three and a half years I’ve stumbled to the kitchen right before I fall asleep and I’ve pulled out a handful of pills, and I’ve swallowed them. Four times a day, 28 times a week, 112 times a month, 1,460 times a year. For the past three and a half years I have swallowed handfuls of medications round the clock 5,110 times. For the last three and a half years I have fallen to the ground, unconscious, unable to care for my own self. I’ve learned the familiar wave of dizziness as the room spins and my body is overcome with sweats and a numb feeling. For the last three and a half years I have taught myself to bend my knees when the all too familiar feeling overcomes my body because then maybe my knees will catch me and protect my head. For the last three and a half years I have become self conscious of wearing shorts because my legs are bruised and scarred from all of the times my legs have protected the rest of my body from injury. For the last three and a half years I have learned how to give up my wants and hopes to settle for safety and protection. I have learned to say no to plans and yes to help. I have become so comfortable in letting others care for me that at times I have forgotten to care about myself. I have become so used to the feeling of sickness and weakness that I have forgotten the feeling of healthy and energized. Three and a half years later I am here, preparing to pack my bags and set off on the greatest, most exciting, yet most terrifying journey of my entire life. I am preparing my body to learn to live without the medications that over 5,110 times I have shoved down my throat. I am preparing to learn to live a life in which I will catch others from falling. I am preparing to begin a life of health and energy. Nothing about this last three and a half years has been pretty, it has been ugly, so terribly ugly. It’s been disguised by smiles, and happy faces, but it’s been hard so very hard. When you are diagnosed with a chronic illness somewhere along the lines you learn the art of masking what’s happening on the inside to portray an image of a brave, strong, fighter on the outside. We all do it, and we all know we do it, because it’s the only way we can get through our day. Three and a half years later after a journey I never ever thought I would take I am somehow packing my bags and preparing to set off on a new journey with endless possibilities. After traveling a journey not chosen by me, I am preparing to set off on the greatest journey of my choosing. I often have covered up the ugly of my journey, we all do in life. Really at the end of the day we are all fighting something, mine has just shown itself in different ways than most. They say you have to walk through the storm before you can see the rainbow, well I’ve walked through the storm, it was a freaking tsunami, and the rainbow, it better be freaking beautiful. If it’s anything like what I’m starting to see then it’s going to be one of those double rainbows from that dumb song. We are all going to be thrown storms that aren’t of our choosing. However it is how we choose to battle and brave the storm that depicts the outcome of it. Don’t let your storm rain on your parade. Walk through your storm, you deserve to see your rainbow. I’ve had one of the most amazing opportunities this year. 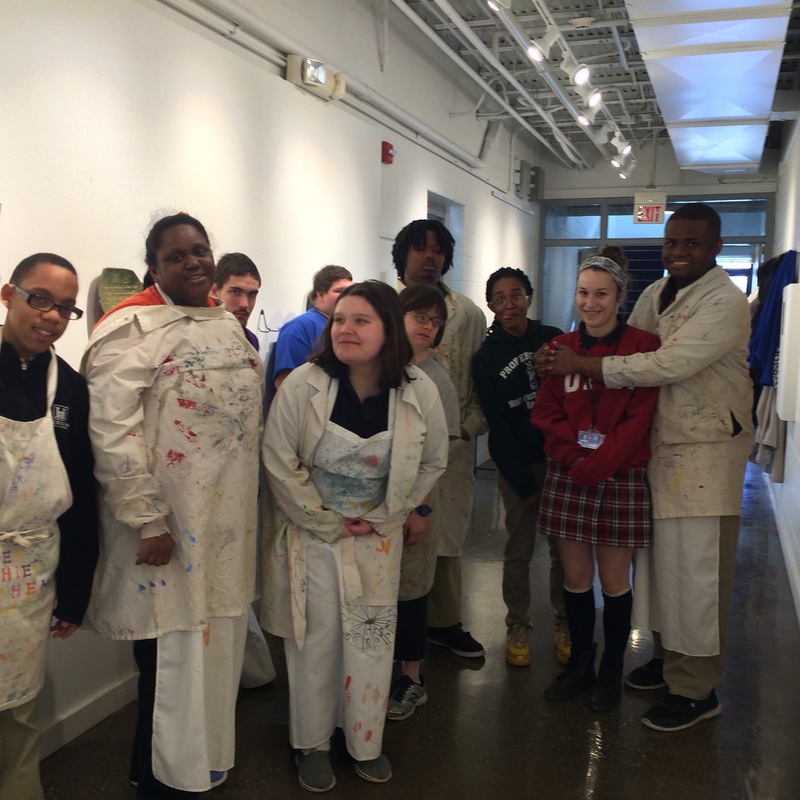 I’ve been able to work as an intern at ArtMix, a program that works to redefine disabilities through art. I’ve always had a a love for art and a love for my peers that have what are considered “mental handicaps” so this internship has been the perfect combination. If you ask me though these students are anything but “mentally handicapped” sure they might take a little longer to do tasks than you and I, and they might not respond the way you would expect them to but they love so deeply, and their personalities are so genuine and full of kindness. I’ve worked with the same group of students for 8 months now, helping to teach them life skills through art so that they may get a job after highschool, as a traditional route of pursuing secondary education such as college isn’t usually the path they take, which is totally okay! I’ve referred to these 9 souls as “my kiddos” even though most of them are my age if not older than me. I’ve gotten to work with them and help teach them things, so in my eyes they’ve become my kiddos. However as much as I’ve taught them I’ve learned so much more from them! I’ve learned and have come to understand each of their individual personalities and strengths. One of the greatest parts of my week is getting to work with them Tuesday and Thursday mornings. I only have about a month left with them which breaks my heart and I’ve been reflecting a lot on it lately because they bring so much joy to my life. I want to share with you each of their personalities and what they’ve taught me in hopes of breaking the stigma of “mental handicaps,” these young adults posess so much potential should we give them what they need to succeed, which I truly believe is our responsibility! Kai is on the far left, he joined my group just this semester so he has only been with the group for half of the time, he is also the youngest. However despite these circumstances he has quickly picked up on the skills and jobs taught in the studio and does work comparative to all of his other peers which is truly amazing! He is a fast learner, and also a eager learner! He is always looking for new jobs and asking for critique on his work. Each day I drive him back to school with me and the first thing he says when he gets in the car is an evaluation of how the day went for him, and how he thought he did. He is so honest about his work ethic that day, and is always sure to problem solve ways in which he might be able to improve his work. Kai is also tremendously friendly and outgoing, he is always sure to ask me everyday how my day is going. He has taught me to always go into things with a positive outlook, and should I not succeed the way I had planned, to re-evaluate how I approached things and problem solve alternatives. Cassandra is one of the sweetest souls I have ever met on this earth. She comes in everyday ready to work and excited about it, she greets everyone each morning. She often sings while doing her jobs, and has a laugh I will never forget. Cassandra is my gossip girl in the group, she’s always up to date on what’s happening in the news as far as celebrities and pop singers go. She knows more than even I do sometimes! Cassandra is always willing to help everyone and anyone, she goes above and beyond when it comes to help. Cassandra is hard driven, she doesn’t give up when she doesn’t get something right the first time, she sticks at it and continues until she succeeds, and succeeds she definitely does! Cassandra has taught me to stick with my goals, and to not give up on them if they seem too hard, or out of reach. Dustin is the goof in the group, he is always the one to crack jokes, and make others laugh. He is quite the trickster and is always sure to pull pranks on others. Dustin works at a slow pace on his tasks but never lets that stop him from finishing them. He has a pride in his school and peers I have never seen in anyone before. Every Thursday he informs me of the football or basketball game coming up for his school, and who their opponent will be. The next Tuesday he always comes in with a report on wether they won or not, and what the score was. Dustin has taught me to have patience in myself, and to know my own pace and not push myself past my capabilities. He has also taught me to have pride in things around me. Jordan is hiding in the back but he is there. His personality however never hides, he is always singing and talking up a storm amongst the group. Jordan has the sweetest soul, he always checks on me after a weekend and asks how my time was. He asks about my friends, and family and if I enjoyed my break. Jordan is a lover of many things and it always shows through his personality, he is passionate about what he loves. Jordan is good at his work, he is dilligent and makes sure his work is always of the best quality. Jordan has taught me to care for others, and to take interest in their lives, he has taught me to be proud of the things I love and to find things to be passionate about. Chelsea is the most observant in the group, always surveying her surroundings, which you can very clearly see in the picture. Chelsea knows her strengths and capabilities and isn’t afraid to speak up if a task might not be in her skills range, she is determined to find something she is good at. Chelsea is always looking out for her best friend Cassandra, and making sure everyone in the group is staying on task. Chelsea has taught me to not be afraid to speak up when something might be out of my capabilities range, and to not settle for something I don’t appreciate doing. She has also taught me to look out for those around me. Sarah is a teacher by nature, she is very quiet but always around to help. Sarah is the first one to step up when someone needs assistance wether it be tying an apron, or teaching a peer a new task. Sarah is one of the most skilled in the group, and also the oldest. She is like the mother hen out of the group. She is loving and takes care of those around her. Sarah has taught me to be patient with those around me, and to always stop and help others when I can. Devon is the shy one in the group, he is comfortable on his own and prefers to be that way. He does his work with great success, he is very good at specific tasks and does them to perfection. He is very specific about making sure everything he does is of greatness. Devon is humble. Devon has taught me to take care of myself, and listen to myself. He had also taught me to strive for excellence in my work. Salena is such a bright soul. She has faced many obstacles throughout the year but always shows up to the studio and does her best work. She is such a cheerful soul and never complains. Salena has taught me to push through obstacles and have a positive outlook on life. Nate, nate is one of a kind. Nate is eager to work and walks into the studio every day with the biggest smile. Nate has a huge heart and is very passionate about his interests. Nate may not communicate like you or I would but he expresses himself in other ways.nate is so smart and is a great example of how just because it may not be evident by looking at him, does not mean he doesn’t posess knowledge. Nate has taught me to simply love life, and to love it greatly despite the bad. Nate has taught me to smile, and to smile often. My kiddos may be handicapped in your eyes but in mine they are perfect. They defy odds, they endure things you and I will never understand yet they get out of bed every day. They never fail to make me laugh, and will always turn my bad days into great days. I will forever be greatful for these souls as they have taught me more than you will ever know. I saw this video today and for some reason it bothered me a lot more than I thought it did. At first I thought it was an awesome video and I know they were trying to convey a positive message. After I finished watching it I liked it on Facebook but then sat there for a second and realized I didn’t truly like it. Yes I know you’re very lost by my rambling so let me explain. The video was trying to convey the message of being happy with what you have. It started off with a cartoon drawing of a man in a nice car who saw a helicopter up above and he had a though bubble about how he wished he had his own helicopter. Then a man in a off road car saw the nice car and wished he had that car. Then a man in a little car wished he had the off road car next to him. Then there was a beaten up car, who wished for the nice car, a man on a bicycle who wished for the beaten up car, a man at the bus stop who wished for the bicycle, and then….a man in a wheelchair who wished he could walk. I’ve been the “disabled” girl, in fact it’s been my life for the last four years now. I’ve relied on a wheelchair to get around, I did it for a year. And while I’m so thankful for the use of my legs, being in a wheelchair was not some horrible terrible absolutely awful tragedy. And I know I can’t speak for those that are 100% wheelchair dependent, because I was not, and I do not know that life. However I do know that being in a wheelchair is not the absolute end of the world. But it’s not the wheelchair that matters here. It’s the pure idea of comparison that was so prominent but ultimately ended in the “disabled” being the pity party. By the end of the video you felt bad because you wanted a nicer car, and there was the little cartoon guy who just wanted to walk. I have a sweet friend Mia, who relies on a wheelchair for just about everything outside of her house. However this wheelchair isn’t a horrible terrible thing, it gives Mia and I the capability to go and do things together. Because of her chair Mia is able to roll along side me and explore the world. Mia, someone who is labeled by society as “disabled” could very well be the person at the end of the video, who “just wants to walk.” And I know this is true for Mia, she would love to walk unassisted on her own. But she’s not here on this earth to be a pity party, to make you feel good about your life, or to be thankful for what you have. You should know that Mia is one of the greatest people I know on this entire earth and the amount of properly functioning brain she has is far less than what you have. But you should also know that none of that matters, her “disability” is irrelevant in the big scheme of things and should have no influence on how you appreciate your life, because she appreciates life too. Rather we should be able to appreciate life together without noticing and feeling the need to compare these differences. I think it’s important to realize that we spend so much time in life comparing ourselves to others. We get so caught up in what we don’t have and we use others to make ourselves feel good about our own situations. We are so busy looking at “disabilities” as such a limiting thing that we forget to realize that just because someone else’s life doesn’t look exactly like yours on the outside in terms of functions or materialistic things that it doesn’t in fact have the capability to be just as great as yours. I think it’s important to stop comparing ourselves to others and to just live regardless of wether you have less or more than the person next to you. YOUR life is a reflection of how you react to that around you. You can use that around you to make yourself feel better about your own image, or you can use that around you to make a change in the world.